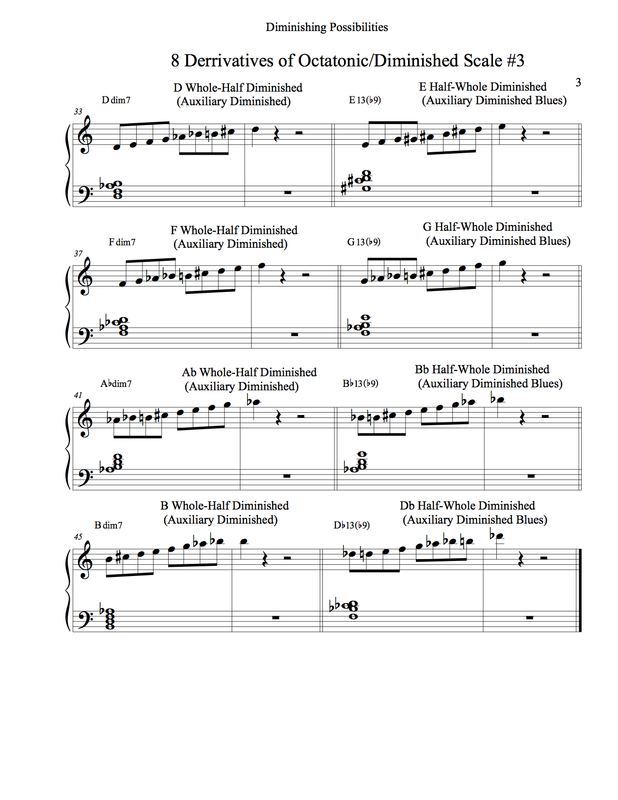 The Diminished Scale is often misunderstood. It is symmetrical, unlike the major scale, and this alone gives it a certain mystery. When you consider its exotic sound, the mystery grows. 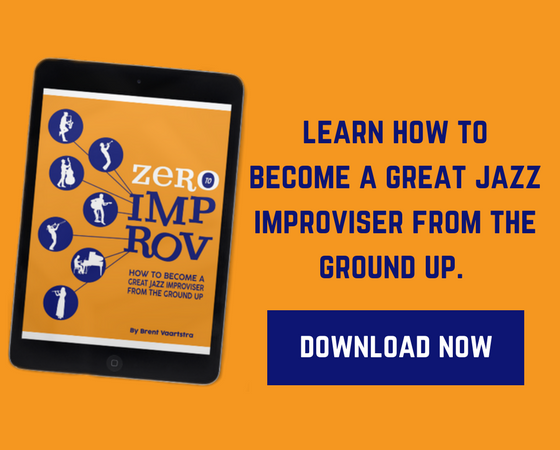 Many people first learn to improvise using major and blues scales, and so we are used to learning scales that have a different scale for each chromatic note you could start on. The symmetry of the diminished scale makes it a little harder to understand, although in a way it’s easier than other scales because you only have to learn three scales, and not 12. Where “h” stands for half-step and “w” stands for whole-step, the major scale is not symmetrical: wwhwwwh. Most scales are not symmetrical, which also means that you have to learn more of them to know them all. There are 12 major scales by sound and 15 major scales when you spell them or write them out (C# major and Db major are the same scale by sound, as are F# major/Gb major and B major/Cb major). Most other scales are not symmetrical. The diminished scale, however, is symmetrical. You can see it’s symmetry when you look at the intervalic composition of the scale. 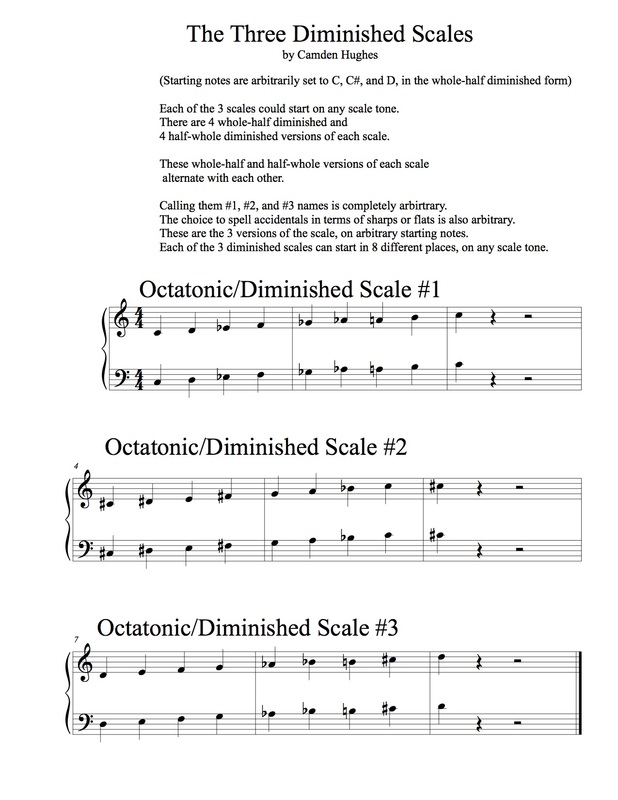 The diminished scale, also known as the “octatonic scale,” is spelled whwhwhwh or hwhwhwhw, depending on whether you start with a whole-step or a half-step. Because of its symmetry, you don’t have to learn 12 of them. There are only three diminished scales, and you repeat the same notes every minor third! This will be covered in more detail in the PDF handouts later in this article. The tetrachord construction for a whole-half diminished scale is a minor tetrachord followed by a minor tetrachord a HALF-STEP up from the highest note of the first tetrachord. The Dorian scale, by contrast, is a minor tetrachord followed by another minor tetrachord a WHOLE-STEP up from the top note of the first tetrachord. See the diagram below. In the above example, you can see the same scale starting on two different notes. In reality, you can start the scale in 8 different places, not just two! These 8 starting places (or 8 derivatives of the 3 diminished scales) are shown in detail below when you examine the musical examples. There are only three pitch collections for the diminished scales, but each of those 3 pitch collections can start on 8 different notes! Depending on which note you start, the pattern will start with a whole step (whole-half diminished) or a half-step (half-whole diminished). These two varieties of the scale alternate with each other, back and forth. 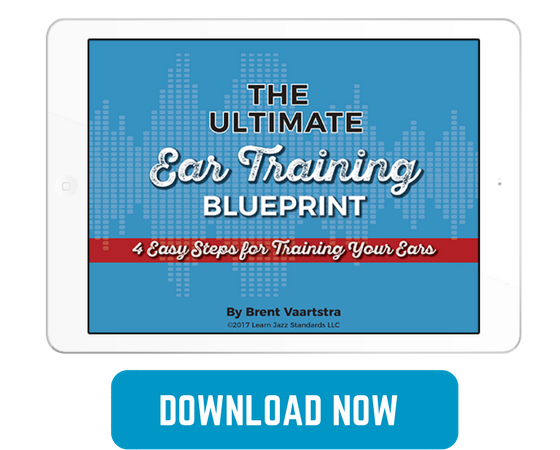 Examine the musical example in detail to see exactly how this works. 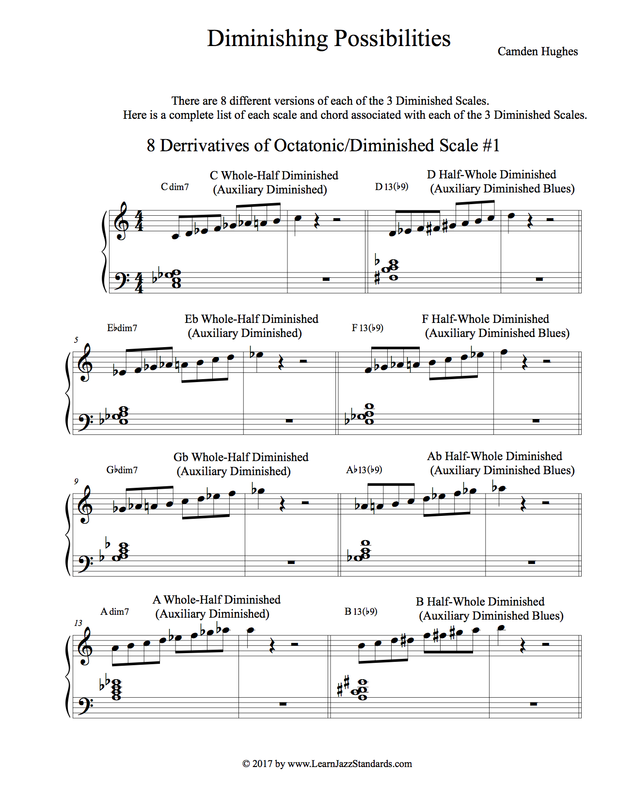 Here are two PDFs and images that help explain the 8 derivatives of the three diminished scales even further. 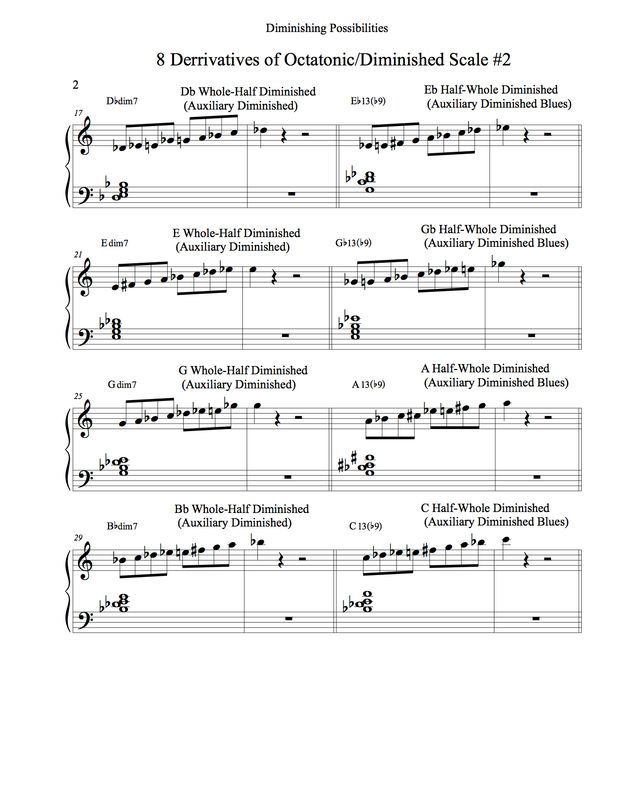 The “Diminishing Possibilities” PDF not only lists out the 8 derivatives of each of the 3 diminished scales but also shows left-hand piano chords that go along with the scales. 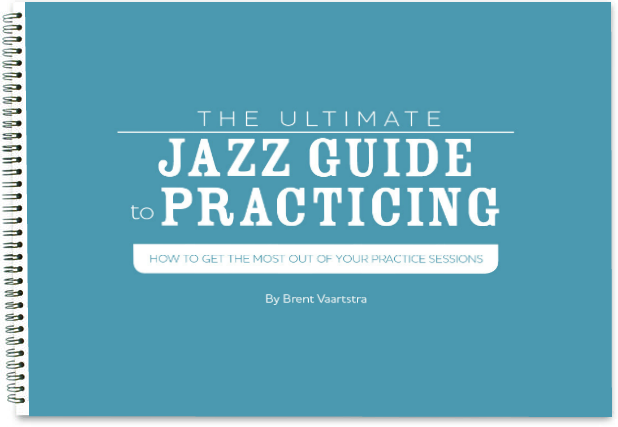 This is extremely useful to know for all jazz improvisers, not just for pianists. If you do the math that’s 24 places you can use the diminished scale (8×3)!